There is no better way to learn about the world surrounding you than to go out and experience the variety first hand. World cultural tours offer the chance for an education on customs and practices in foreign lands that show how connected we truly are in this world. Whether it is a trip of a lifetime or an annual escape to better understand the world we live in, our world cultural tours will leave a positive lasting impression on all who partake. 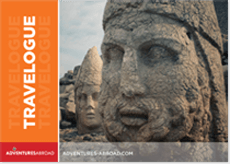 Adventures Abroad has been leading small group tours around the world for over 25 years. Since we started, we've created over 400 unique itineraries to over 120 countries. With group sizes capped at 18, we ensure that members on our world cultural tours are being led on a sustainable trip with a focus on intimate and thoughtful journeys that showcase the authentic side of a country. Our team of professionals ensure that the highest quality of local guides are used to portray what life is really like, with in-depth discussions on customs, family, and local issues while explaining heritage, historical, or environmental wonders within the destination. Local guides work closely with our expert tour leaders that ensure logistics are handled smoothly and efficiently. By staying in well-appointed hotels, our travellers have the chance to see neighbourhood lifestyles and get a better feel for the places visited. Each activity is meticulously researched and reviewed after each visit to ensure that time spent on our world cultural tours genuinely give insight to the region and will continue to be well received by our future travellers. Our tours spend each night in a local restaurant, ensuring a fun night out and a chance to taste local flavours. We actively avoid hotel restaurants and buffets because we believe that interactions within restaurants used by the community provide a better sense of understanding to the destination. With travel programs that reach over 120 countries, Adventures Abroad has many different styles of world cultural tours. To explore European history, our itineraries vary from a Nordic cruise across Scandinavia, train travel between cosmopolitan cities of Central Europe, hiking the pilgrimage routes of Spain, exploring the tiny microstates of independent nations surrounded by the European Union, as well as tasting our way through culinary tours to Piemonte. Depending on the level of fitness and area of interest, our European cultural tours cover almost all of Europe from less explored regions such as Albania, up and comers in Eastern Europe such as Romania, to the far flung islands of Portugal's Azores or the northern reaches of the Faroe Islands. In Africa, our world cultural tours explore a continent that is large and diverse. Areas of West Africa offer an incredible diversity of traditional people, from the voodoo culture of Benin to the Jola people who are one of the longest inhabitants of the Senegal-Gambia region. In northern Africa we discover the histories and traditions of the Berber peoples, some of whom are still a nomadic people in the Middle Atlas mountains of Morocco. Across East Africa and Southern Africa, we learn of many different tribes and many different ways of life that include locational, traditional or modern struggles. From watching a performance and touring a village with the red dressed Maasai Mara people of Kenya to learning of the brave men and women who faced recent struggles of ending the apartheid in South Africa. World cultural tours in Asia show an ancient land intricately woven with religious temples. Taking in a sunrise at Angkor Wat in Cambodia, watching the mist rise from the platforms at Borobudur in Indonesia, or exploring the Cham ruins at My Son in Vietnam are all equally beautiful in their settings and enlightening in their histories. Discover the fast pace of innovation and technology in metropolitan cities such as Shanghai or Tokyo before appreciating the relaxing atmosphere of traditional settings in Pingyao or Kyoto. With our local english speaking guide, we navigate the contrasts of this rapidly expanding continent while appreciating the rich history of these lands. From the silk road to hidden kingdoms in the mountains, every corner of Asia lends itself to a lesson in grandeur. Witness the melding of cultures, with colonial charms built beside Mesoamerican wonders throughout Central and South America. Discover young countries with a turmoil ridden past and a promising future. Learn about island cultures and ocean going empires within the South Pacific. Find out more of the oldest living culture in Australia. No matter where you end up, our world cultural tours will surely give you the best insight into the uniqueness of each region and an authentic appreciation for how life is lived there.